The political gift book Fun with Muslims was published in April 2004. Since 9/11 and the political campaign of Islam-critical Pim Fortuyn, the atmosphere in the Netherlands had become rather negative towards Muslims. Until then there had been dissatisfaction with immigrants and refugees, but the focus on Muslims in specific was new. Elena Simons heard the issues discussed on the radio, her main source of news. Headscarves became controversial. It was said that Muslim men oppress their wives. Moroccan youth became seen as pickpockets. And of course, you never could be sure whether your Muslim wasn’t secretly scheming to stage a terrorist attack. The result is a book full of adventures such as shopping with a fundamentalist, playing badminton with a Moroccan in jail and a visit to Six Flags with a Turkish family and a racist. As it turns out, Muslims are loads of fun. Or, to be more precise, ‘the’ Muslim doesn’t exist. The people Elena spoke too had extremely different views on religion and life in general. In addition to all the stories and adventures, the book contains many humorous suggestions for Muslay people who also would like to enjoy Muslims. 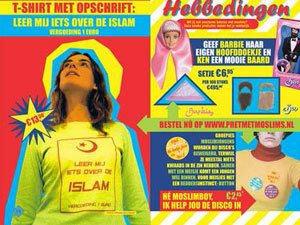 There’s a T-shirt saying ‘teach me something about Islam and I’ll pay you a euro’. There’s a headscarf for Hijab Barbie and a beard for Fundamentalist Ken. The book contains a list of useful sentences in Arabic, such as ‘Hello there, beautiful’ and ‘There never were men on the moon, the Americans just pretended.’ All of this in a pretty and colorful design.